As we come to the end of our jaunt to cyber-India, otherwise known as the Mumbad Cycle, Netrunners.co.uk contributors and friends take you through some of their favourite cards of the cycle. Join us, won't you? OK. Right, I’ll be honest, when I saw it spoiled I hated this card. And let’s be honest, it does have all kinds of problems from a game design point of view. Having rebirth as one of in a deck only increases the variance between games you draw it and games you don’t. It’s a fun but pretty useless card for most while being very powerful for runners who can use it without loss. Andromeda and Val are the obvious choices though if (like Sam Burdock) you’re a braver player than I, it also works for The Professor. Finally, what is with the theme? What exactly is supposed to be going on here, A Doctor Who style regeneration? Suffice to say, I wasn’t buying it. But… but… then I got the pack, gave it a try, and every time I play this card I stick my hands up in the air and shout ‘Rebirth!’ with irrational exuberance. 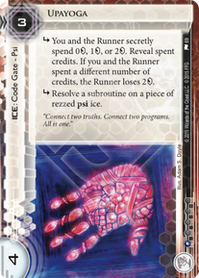 I’ve mainly played it out of Val, and the Anarch pool of IDs makes this card one of the most powerful and interesting effects in Netrunner. Sometimes your choice is obvious. If they’re on HB or most kinds NEH, drop Whizzard. Suddenly you’ve got yourself a better scrubber that can’t be trashed and costs zero to play. They’re on a scorch deck, great, go Kim and trash it from hand. But over the course of only twenty or thirty games I’ve rebirthed into every possible runner but Maxx. I’ve turned into Quetzal to Knifed an annoying Wraparound, gone into Reina when they haven’t had much ICE rezzed, and once saw that my only hope of beating a CI deck was becoming Noise and using clone chip and viruses to disrupt the combo. Heck, I’ve even become Nul to stop them springing a komainu and CVS on me. Along the way I’ve grown to appreciate the abilities of runners I’d never really played and had to think through options in a way most cards never ask. So, consider me a changed man, a reborn man if you will. I bloody love this card. I looked at a number of cards to write about, I'm a big fan of Voter Intimidation, Corporate Sales Team and Artist Colony and thought about writing about these. However some of them I haven't played enough with and others are a bit boring (looking at you CST). However a card I have played a lot with is Sensie Actors Union, and this is a fantastic card. If you are playing a fast deck such as NEH Fast Advance then this card helps you get to the card you need without risking agenda flood. If you need an agenda, economy or a FA tool, this card will get it for you. A popular deck type currently is IG and this card does wonders there, as you want to draw more cards so you can discard into archives and you are playing 3 point agendas and this allows you to bury them at the bottom of R&D. Even in glacier this card does work, as it allows you to set up in the early game and not get flooded. Obviously this card does come with downsides - it cannot be protected with ice, and it has a low trash cost. The decks that generally play this card have a way of dealing with these downsides - NEH often throws out so many assets the runner cannot trash them all because of clicks or credits, and IG has a way of boosting the trash cost or penalising the trashing of assets with Hostile Infrastructure. This card is great currently, and I think could well be essential when Jackson Howard cycles. 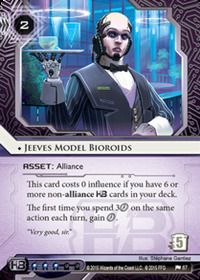 It didn't take me long to identify Jeeves Model Bioroids as my favourite card of the Mumbad Cycle. JMB hits the mark on stats, flavour and power level. He is two credits to rez and five to trash; he has to be rezzed to oversee all three clicks to do his job; and his drawback is fairly well balanced. So far, he has shown up in a variety of places fulfilling a different purpose in each deck. Jeeves can be a distraction or a combo enabler but I think the designers are trying hard to give more decent Fast Advance tools to all the factions. See also Political Dealings and Mumbad Construction Co. However I believe Jeeves' full potential is yet to be unlocked and will only get better with time. After reading The Worlds of Android, Haas-Bioroid is definitely my favourite Corporation and considering Jeeves Model Bioroids are everywhere they need to be, it's only a matter of time before Director Haas makes a huge power play! Whilst decks from some of the premier minds of the competitive game included this card (with its dance partner Fan Site) to give Hayley further flexibility – reaching for Political Operatives, Clots, breakers or whatever they needed– there were those out there who were installing all sorts of things from the deck. My personal list included Raymond Flint, The Source, Ghost Runners as well as some more sensible cards. Maybe there were those who installed a program from deck to enable them to use Brahman, or installed Street Magic to save themselves from an Archer, or a Q Coherence Chip to increase the strength of their Sage; we will never know. And that, right there, is what makes the card so beautiful and such a perfect example of what I enjoy about Shapers at their best: you never quite know what they are going to do be able to do next. This is the agenda that the game needed. Neutral, no influence and an effect that corps always want, delivered in a way that is useful and at a high power level. Having powerful but not game-defining agendas like this in neutral makes corp deck construction much more interesting. You genuinely have choices about different agenda suites to support different strategies without sacrificing too much power. The game needs more agendas like this! Runners needed a way to interact with a rezzed Caprice and Ash. This card is an intelligent and interesting way to allow that interaction without making the card too narrow. You're often happy to have this against the ubiquitous Jackson Howard, and it does deal with Caprice and Ash really well. The HQ run restriction places it well in criminal thematically and mechanically, but the one influence allows it to be played widely. All in all, this is a real hit for me. This is a fantastic shaper card, perfectly balanced between incredible power and very high cost. The ability to tutor any card from your deck at instant speed as the runner in response to corp threats is amazingly powerful, opening up decision trees and creating opportunities for new and interesting lines of play. The cost on this card is steep, however, meaning that it is a massive test of skill and judgment as to when to pull the trigger. How valuable is that card from your deck going to be, is it worth more than the 1, 2 or even 3 points you're throwing away to get it? Plascrete that saves the game, or a Killer that saves your rig from an Ichi will often be that important. Sometimes even a breaker to get into a server with what you suspect is an Astro or a Nisei in it in order to deny the corp that precious agenda counter is worth sacrificing an agenda for. I love the power, high skill ceiling and impactful nature of this card, and the fact that it allows Shapers to play just that little bit more aggressively and interactively. This card is by far the most interesting and bang-for-your-buck ICE I’ve ever played. It is obviously a piece of ICE that only shines bright in Nisei Division, but there it activates so many things on the board. Wherever you put it, it is activated by any other kind of psi ICE. Take for example the time that I had a Marcus Batty on the remote and I fired my Upayoga on the same server to fire the rezzed Chetana on R&D costing the runner all of his grip to net damage. Crazy. This piece of ICE, just like other psi ICE has the amazing low value, big strength thing going on. Rezzing it for 3 credits and having it stay there at 4 strength with 2 subroutines, is just amazing. It is activated so easily and in Nisei Division, you can spend just 1 credit during the first subroutine in order to make sure the runner loses at least 1 credit (if they pay 0 in the psi game, they lose 2 creds, if they pay 1 they lose 1 and you lose nothing even though they won). So unless you want to make a credit, you just force them to lose 1 every time. Same thing with the 2nd subroutine if you want to make them lose more credits. I’ve had servers with x2 Upayoga and a Caprice Nisei in the end of it. Imagine the value that came out of that! Overall, a very good ICE that is an instant x3 inclusion for Nisei Division decks right now. My first love of Netrunner was Jinteki kill. This card is the biggest thing for Jinteki kills decks since Ronin and that is long time ago! Before Ronin you never ran anything that was installed and advanced, but then you had to risk face-planting a Junebug or a Cerebral just in case you might die next turn. This has the same cumulative effect: 3,4,5 face down remotes in the Jinteki shell game you'll have to start checking them soon which brings Psychic Field, Snare, Shock and Fetal AI into play. The card gets better still when you combine it for a lock with Genetics Pavilion and Hostile Infrastructure. For an install (maybe gaining a credit with Turtlebacks) you can do them a net damage with Hostiles and cost them 2 credits. Industrial Genomics makes it more disgusting obviously, but it also makes Personal Evolution and Biotech more playable too. It also works in other kill decks, try it with scorch when you catch people unawares, pinging them down to 3 cards and all of a sudden an SEA Source scorch, or double scorch through a single plascrete will get the job done. Before this card you could sit back and manage the threat of Jinteki. This card, just by its existence, can make the runner uncomfortable and proactive sooner than they'd like. And that, against Jinteki is how you get deaded. When deciding on a favorite Mumbad card the obvious choice was the crowd “favorite”, Museum of History! 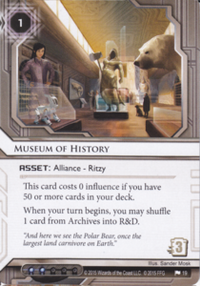 Upon initial observation, Museum appears to be a naive card. Sure, it puts a card back into R&D every turn. So what? The game might be over by the time you draw that card. Heck, it’s just an asset, the Runner trashes and we’re done. Who cares?! However, this straightforward analysis hides a dark, terrible truth. One of the central tenants of Android: Netrunner is that as the game gets longer, central servers are more of a liability. Museum unapologetically breaks this mechanism. It opens up a Corp strategy that rely on postponing the game indefinitely. Why win when you can just not lose? As the game grinds to a halt you will be safe behind a thick R&D. It is rare for a single card to so strongly mobilize a large subset of a gaming community. Gamers always get annoyed with one thing or another, whether it’s Dr. Boom (Hearthstone), Jace (Magic: the Gathering), or Radagast (Middle Earth: the Wizards). Museum was so revolting to one player that he printed a “Ban Museum” T-shirt and handed it out for free during Origins! The innocent design that lead to such a substantial shift in how the game could played wins my Favorite Mumbad Card award. What makes the card interesting is that it's not just about the ability to access additional cards. It also helps newer and intermediate players focus their play style a bit more on forcing a reaction from the corporation. By running facedown ice and attempting to force the corp to react (even without breakers) they could build these counters to help during a later state of the game while applying early pressure to rez ice. The card rewards you for repeated accesses on the central servers you attack most often, but can also be used in a pinch during instances where you want to attack a server you haven't been focusing on heavily during the game. Lastly, we've all had games where in spite of the cards we have accessed the agendas just seem to slip past us. Maybe we Legworked a hand of 4 and missed the single agenda. Because of TTW, at least now you're gaining later accesses as a result of whiffed HQ or R&D accesses. It turns every 2 failed accesses for an agenda into potential. It passively does a fair amount of work for you, while playing the game the way you normally would. 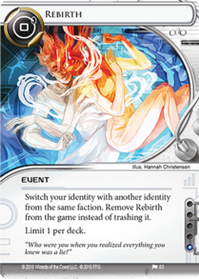 I have chosen my card as it has started a revival in the faction that was my first Netrunner love - Criminal. Political Operative has given Criminal a very direct answer to what was previously their hardest match-up: glacier. Pol Op allows a Criminal to trash, at instant speed, Caprice Nisei. This is an extremely powerful ability and one that allows runners to convert early HQ access into late game remote lock. I also feel the card has been well designed to offer more utility than just trashing Caprice. A good corp player may be forced into using a Jackson Howard prematurely when a player runs HQ, threatening a pol op install. Political Operative is a powerful card with diverse utility given to a faction that needed it most. Freedom Through Equality does a lot of things that I like. The card is simple to grasp, but it leads to interesting game states. I included it in a deck because I thought it looked like fun but I quickly learned that it’s actually very playable. 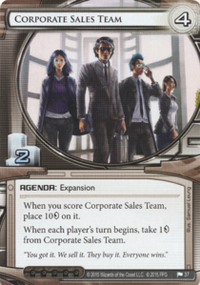 Corp decks nowadays tend to be built to allow the Runner to come just short of the full 7 points required to win the game. NEH Fast Advance, Palana Foods and Industrial Genomics are all happy to let the Runner get to 6 points, with the plan being that they close out just before the runner can grab the last Agenda. The power of Global Food Initiative is that it provides the Corp with a scoring plan that’s worth 7 points to them but 6 points to the Runner. This 3 cost current gives us the freedom to close that gap. I’m a big fan of Runner cards that allow the Runner to turn a favourable board state into a game win. We’ve all had those games where the Runner makes efficient plays until they have board control but can’t close out because the Agendas are buried deep in R&D. 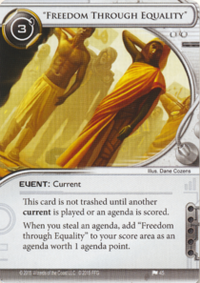 Along with Notoriety and Keyhole, Freedom Through Equality allows us to bring points of our own into the game, avoiding those situations where the Corp slowly clicks for credits and then builds a winning board state. Freedom Through Equality is well designed because it isn’t just free value. We don’t just play it and have something good happen. It provides the runner with a big benefit (an agenda point) but also asks us to commit to it, to be willing to work for it. We don’t need to build around it so much that our deck becomes inconsistent jank, but we do need to make allowances for it. As far as I’m concerned, giving good rewards for hard work is great card design. I also appreciate that this is a 0 influence Neutral card, and that each faction has its own ways to enable it. Indexing, Keyhole, Spy Camera and the Turning Wheel are just some of the ways to ensure we get our freedom. Finally, this card sums up one of the great things about the Mumbad Cycle to me. The aesthetics and flavour are excellent. The art in the card depicts figures covering their necks, making it impossible to tell if they’re clone or human. While I consider myself more of a competitive and game focused player, the flavour is part of the appeal of Netrunner for me. Playing old-school Netrunner is hard right now. So much so that almost all of the strongest corp decks at the moment are side-stepping traditional ICE suites for horizontal play supporting a difficult to contain fast advance strategy, a slow, grinding death from which the runner cannot escape or scoring seven points in a single turn. While Palana still carries the flag for glacier in competitive play, it’s telling that the once mighty Engineering the Future has receded in the wake of the sometimes unstoppable tide of Anarch ICE destruction. Now, anyone who knows me knows that I’m one of the few idiots still playing a rushy gear-check strategy and let me tell you – it’s rough out there. Even with an ICE suite designed to tax and trouble Faust, the number of tricks anarchs can pull, from D4v1d to Datasucker and Clone Chippped Parasites, makes it incredibly difficult to score from remotes. The popularity of Hayley with instant access to a collection of the finest breakers money can buy through Artist Colony might have been the final nail in the coffin for traditional Netrunner. Into the spotlight steps our newest grid. If this card acted exclusively as a hard counter to D4v1d it would be worth discussing: many of the top decks are entirely reliant on it to deal with large ICE and it does so with such efficiency that many pieces of ICE – particularly in my beloved Weyland – aren’t worth considering. However, it does so much more than that. Self-Modifying Code almost becomes an expensive Special Order that requires MU support and Clone Chip a better Déjà Vu rather than the powerhouse that saw it hit the MWL earlier in the year. The fact that it can be rezzed as a surprise when the runner initiates a run, assuming themselves safe behind an aegis of tutoring or recursion, is beautiful. It’s a brand new type of threat we’ve not seen since the release of Cyberdex Virus Suite. And so we say goodbye to the subcontinent and one of the most exciting, thematic and controversial cycles released so far. Why not comment in the forums or wherever you found this and tell us your favourite card of the cycle? We'll be back after the Flashpoint and until then I'll leave you with the words that a fellow visitor said to me when I was leaving India: "One in three people who travel in India leave carrying some kind of food-borne parasite." Thank goodness FFG released Magnet.